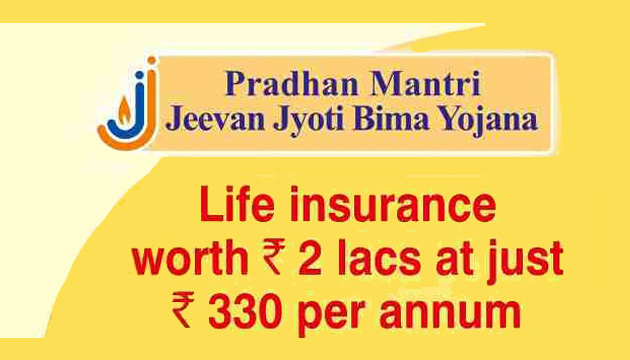 Pradhan Mantri Jeevan Jyoti Bima Yojana (PMJJBY) is a one-year life insurance scheme, renewable from year to year, offering coverage for death. The cover under PMJJBY is for death only and hence benefit will accrue only to the nominee. PMJJBY is a pure term insurance policy, which covers only mortality with no investment component. PMJJBY is available to people in the age group of 18 to 50 years (life cover up to age 55) having a savings bank account who give their consent to join and enable auto-debit. The cover is for a one-year period, starting June 1 to May 31. As on May 8, 2017, nearly 3.11 crore people had enrolled under PMJJBY, and the total number of claims received till date were nearly 65,083. Under PMJJBY scheme, life cover of Rs. 2 lakhs is available at a premium of Rs.330 per annum per member and is renewable every year. In the case of a joint account, all holders of the said account can join the scheme provided they meet its eligibility criteria and pay the premium at the rate of Rs.330 per person per annum. c. Reimbursement of administrative expenses to the participating bank: Rs.11 per annum per member. For the cover period 1st June 2017 to 31st May 2018, subscribers are required to enrol and give their auto-debit consent by 31st May 2017. Those joining subsequently would be able to do so with payment of full annual premium for prospective cover. 1. Nominee to approach the bank wherein the member was having the ‘savings bank account’ through which he/she was covered under PMJJBY, along with the death certificate of the member. 3. Nominee to submit duly completed claim form, discharge receipt, death certificate along with a photocopy of the cancelled cheque of the nominee’s bank account(if available) or the bank account details to the bank wherein the member was having the ‘savings bank account’ through which he/she was covered under PMJJBY. 1. Upon receipt of death intimation, the Bank should check whether the cover for the said member was in force on the date of his death, i.e., whether the premium for the said cover on Annual Renewal Date, i.e. 1st of June, prior to the Member’s death was deducted and remitted to the Insurance Company concerned. d. Photocopy of cancelled cheque of the Nominee (if available).